Patience is not one of my virtues. Over the past few days, I have hosted an ongoing inner battle between the new me, the one who knows that we're in the Islands and nothing gets done quickly... and the old me who wants everything done yesterday and will keep on hammering away at it until it's done! On one hand, I know that we have an entire month to get this work done. 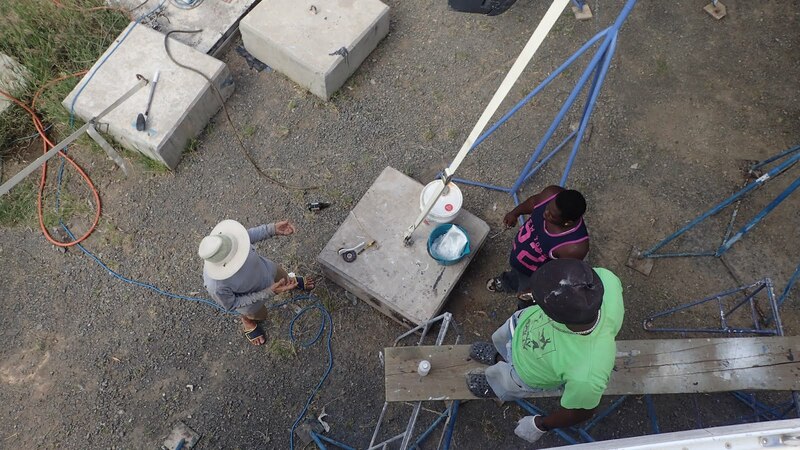 It's a hot and dirty job and the work crews here are not like those in the US. People here aren't always compelled to work harder and faster by the almighty buck! But on the other hand, the longer we have to idly wait, the more time my mind has to create wild and insurmountable problems where, hopefully, there are none. Don't panic! 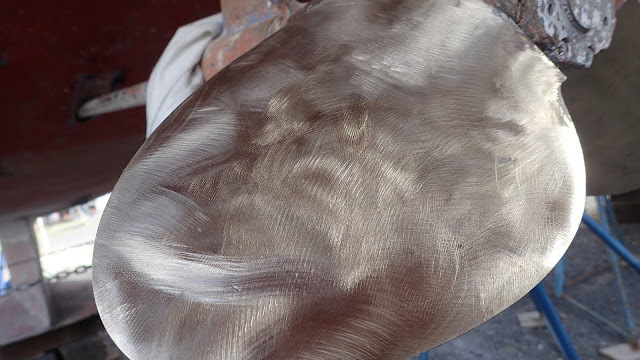 With the paint gone, the fibreglass hull is translucent! When the guys left on Friday afternoon, they said they would probably come work some on Saturday. I should have known that "probably" was code for "no chance in hell". 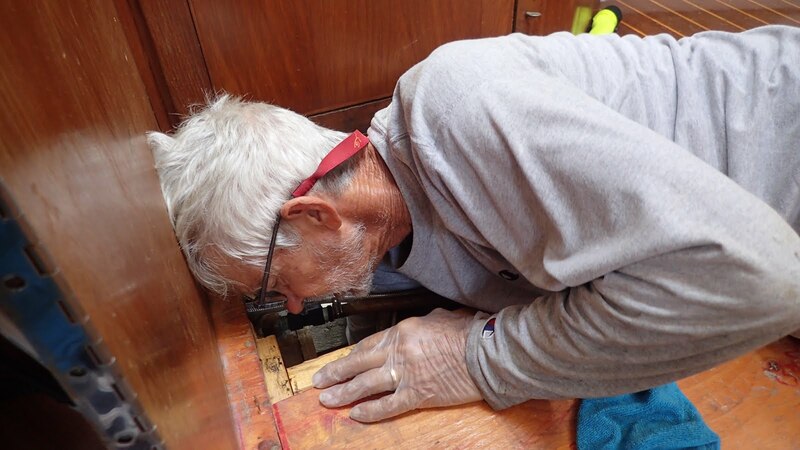 The keel inspection and fibreglass work was scheduled for Monday morning to give Bruce and I some time to clear things out of the bilge so that Anderson will have space to work. A preliminary inspection revealed something I had noticed years ago, but Bruce poo-poohed. 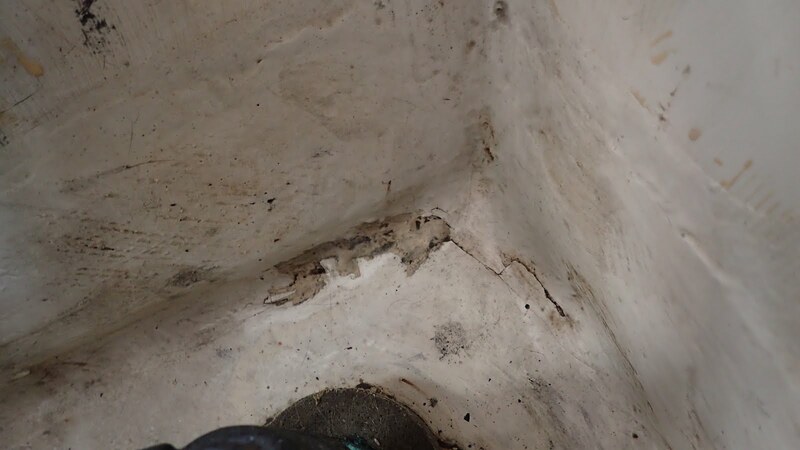 There was some fiberglass in the floor of the bilge that was cracking and flaking. 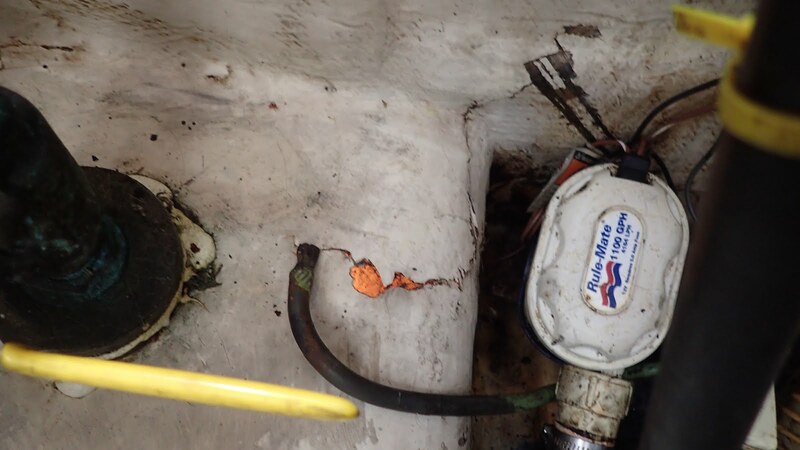 Now is the time to fix it but we've got to move the pumps and hoses that live down there first. Those cracks are likely the source of the wet spot on the outside of the keel down below and the reason that the two previous repairs have failed. 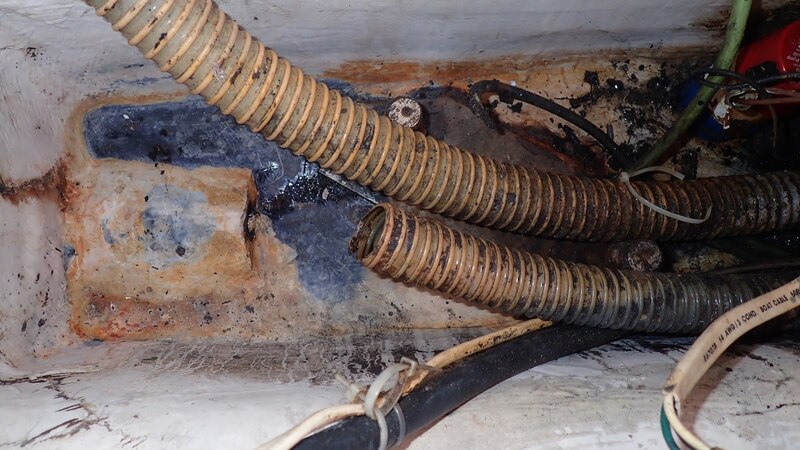 And before you ask... "why is there water in our bilge?". 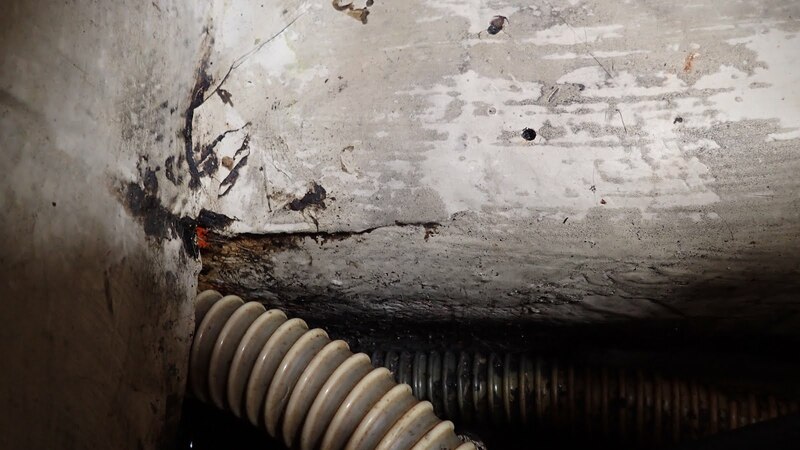 Well THAT is because the rudder post has been leaking steadily since our last haul out due to improper packing and tightening of the nuts. So throw that onto the pile of things to have done while we're here! Pretty sure somebody tried to putty this before! 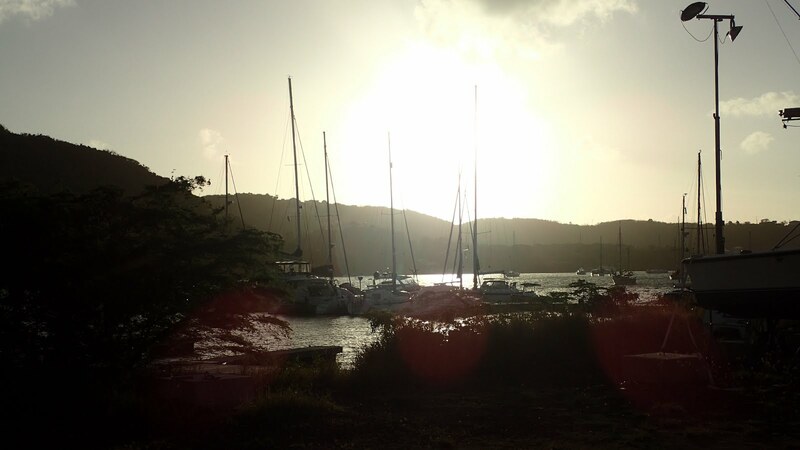 Saturday dawned with our ears straining to hear the sound of scraping on the hull. Morning melted into afternoon and we eventually gave up hope that any work would be done today. 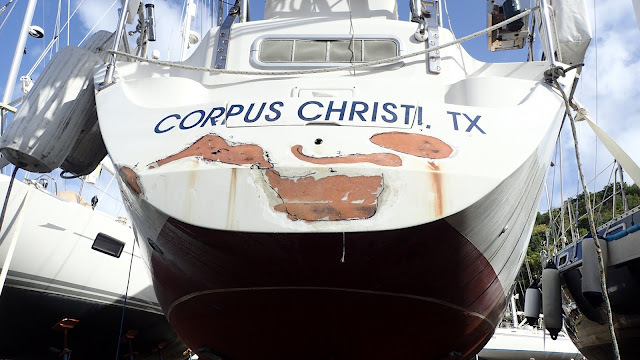 Like a rubbernecker passing a car accident, I was drawn to examining our hull in search of other telltale signs of trouble better met now than later. 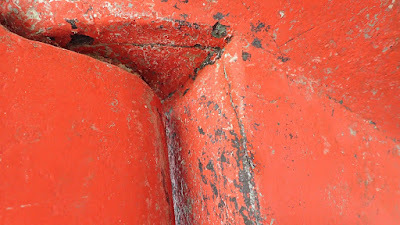 And of course my keen eye found what appears to be a crack around our rudder post. We'll show that to Anderson to see what he thinks... if we ever see him again! This is AFTER we cleaned it out! 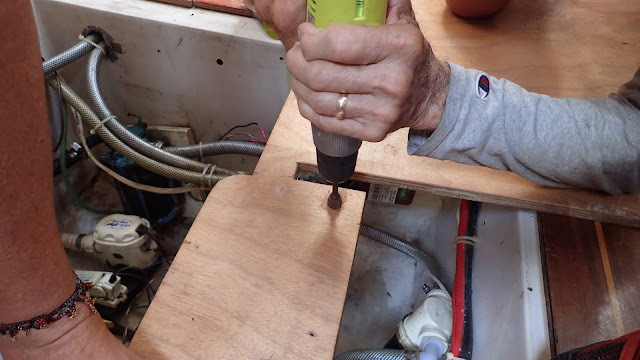 Removing the flooring near the mast where we keep one of our house batteries, there is a hole cut in the saloon liner. Down inside that hole lives the first set of keel bolts. 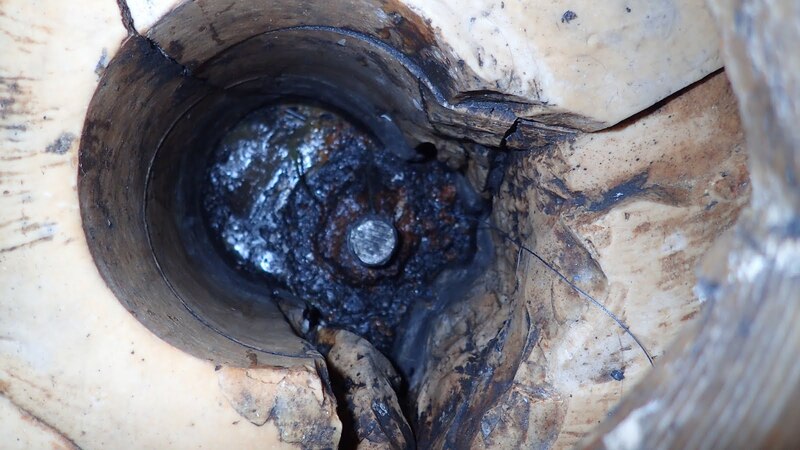 Bruce gasped when he peered down into that hole and found about four inches of sludgy oil. I am not proud of this, but it is what it is. Somehow (if this wasn't there from the previous owner) the oil had made its way into this hole and there it has remained until now. Bruce went through half a dozen rolls of paper towels and every cleaner we've got onboard to get as much of the black oily substance out of that hole so that we could see the keel bolt. Once he was finished, I took my turn at it to see if I could get it all clean. I finally gave up because the material surrounding the hole was unevenly chipped and cracked and the oil just clung to those recesses. We worked most of the day cleaning out the bilge and figuring out how to get the flooring up to expose the aft end of the bilge. When we installed our water maker, we drilled holes in the flooring to allow the hoses and electrical wiring to pass from beneath the floor to the pumps. This looks very nice, but it does not allow any way for us to pull up that piece of the floor without disassembling the water maker. By Saturday afternoon I was seriously distraught about this. I didn't want to open a whole new can of worms by taking the water maker apart. We decided to sleep on it, so I called Anderson to see if he had a saw we could borrow, while Bruce put the saloon back in order. 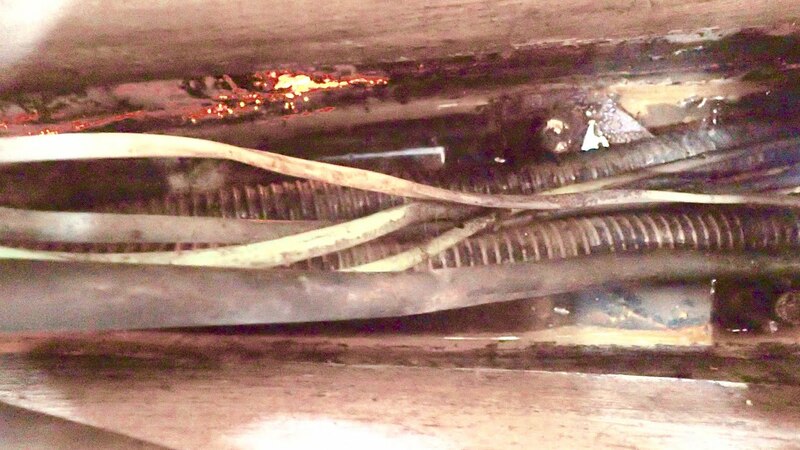 Normally hidden by floorboards, I was appalled to see this nasty mess! Well, it is what it is! So far, there have been more NON working days than work days! We will press on! 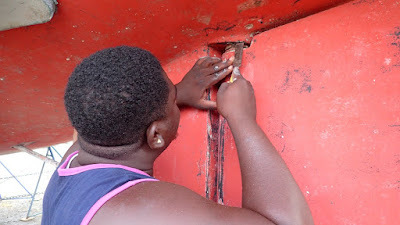 As soon as Anderson left, we got busy taking the hoses off of the water maker and disconnecting the power. We pulled up that floor section and revealed the mess of dirty bilge hoses and wiring and more translucent spots where there wasn't any bilge paint. Some things are better left unseen! 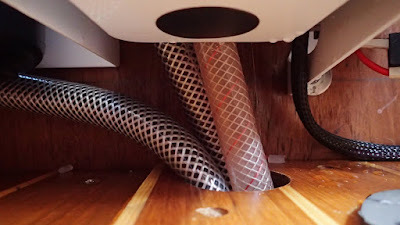 I cut the side out of the hose access hole in the flooring and Bruce made the hole where the wiring passes through a bit larger to accommodate the connectors on the ends. We installed new connectors and re-attached everything before we had time to forget how it all went! 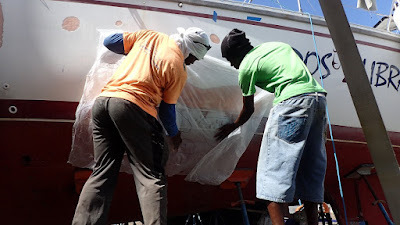 Then we went to work cleaning and organizing that bilge. We thought it would be nice to replace the bilge hoses because they were so grungy, but when we traced their path it became clear that this was a project for another day (or maybe never). 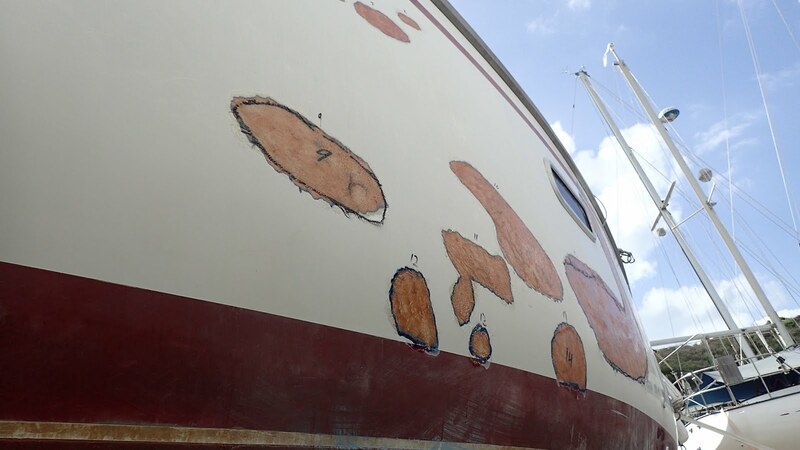 We wiped up handfuls of gumbah that has been sloshing around down in the bilge for years... It was disgusting! 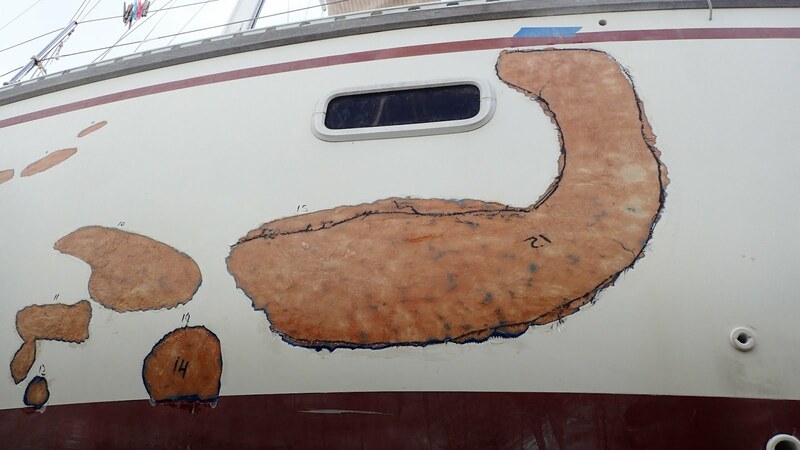 Although we hated every minute of this exercise, we couldn't help but feel like we would be so happy when it was all over and we knew our bilge and keel were in good shape going forth! All of this will come out when Anderson goes to work! Eventually we had to finally call it quits. We put everything back together once again, reattached the water maker electricity and made sure it all still worked. We were both filthy and a shower never felt as good as it did this hot and windy Sunday afternoon! Monday morning we were super excited to see Anderson get to work on the bilge and keel bolts. We got everything ready for his arrival and waited. And waited. And waited. Finally Bruce went to work on removing the growth from our prop. It would save the work crew some time and get us that much close to bottom paint. Eventually the work crew did show up. They arrived and put up some scaffolding so that they could make plastic patterns of all the hull spots in preparation for purchasing the fiberglass materials. Ah there's Anderson! No bilge work today! 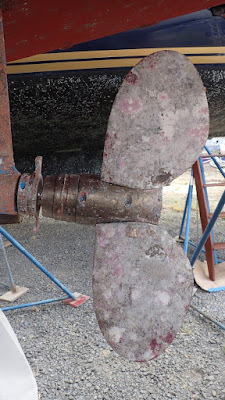 A borrowed tool sped up the job of cleaning the prop. Looks NICE! We look like a spotted cow! These stress cracks have caused me stress for a long time! Not quite tall enough to reach the bow! 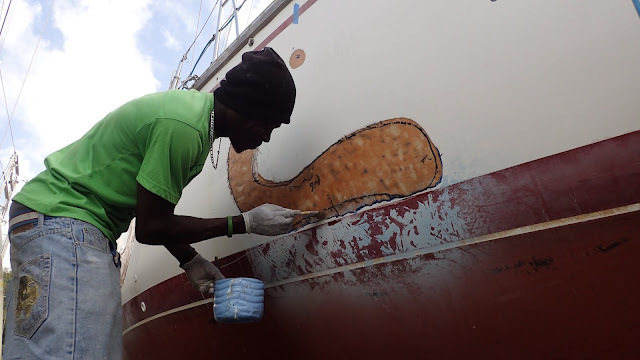 Anderson showed us the light-coloured marks where our keel has been flexing. All that will be fixed! He's poking at it. Will glass it over! So Monday we made some progress. I had a chance to talk to Anderson about all of the things we've got going on. He gives thorough, understandable answers that go a long way toward soothing my nerves. It's just when he leaves that my terrors return! I Showed the rudder crack to Anderson and he said he could glass that up to add strength. We will have the technician doing the rudder post work give us another opinion as well. Can't have our rudder falling off, now can we??? 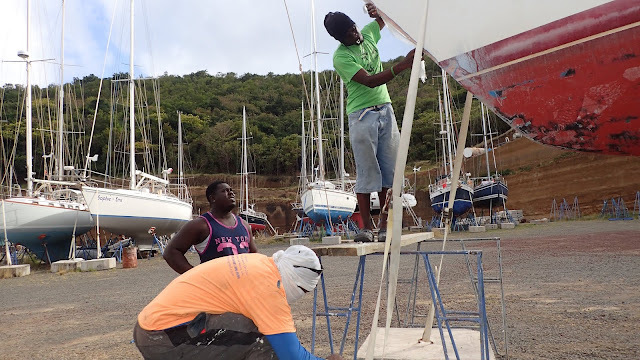 Needless to say, no work was done on the bilge, but Anderson assured us that, even though it was Election Day, he would get right to it on Tuesday... right after he was done voting. (Insert music to the tune of "Ain't Never Gonna Happen") Yeah. So now we're up to Tuesday. Wednesday will be a week we've been in the yard and there hasn't been much ticked off of our long list. Actually NOTHING has been ticked off of the list, but I'm beginning to feel a little ticked... Guess what. No Anderson. Tuesday was sort of a drag all around. There was a broadcast warning that Kick 'Em Jenny was experiencing an increase in seismic activity. Great! That's just what we need. An earthquake with us all propped precariously on spindly stands on the LAND!!! Normally when earthquakes happen, we're on the water so we never feel them. This could get interesting... and it sure added to my anxiety level. 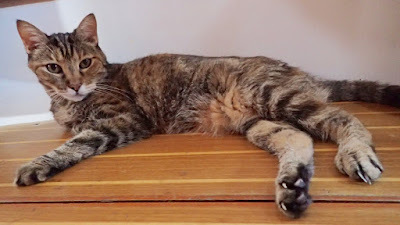 Next on our list of things-that-we-don't-need-today is the cat. She started exhibiting symptoms of what I can only hope is a stress-induced UTI. She had one back in St. Martin and had a week of antibiotics. That was miserable for all concerned. We called the Mobile Vet (YES! There's a mobile vet here!) and he promised to come out in the afternoon after he voted. This voting thing is really beginning to get on my last nerve! 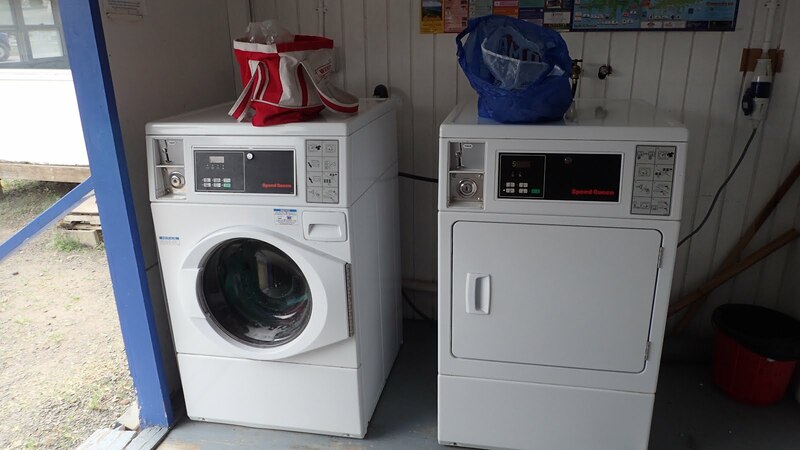 I was able to turn it to my advantage when I found the laundry machines free! I've been trying to do laundry for days but there always seems to be someone in there. Today - that someone was off voting and I had my chance! 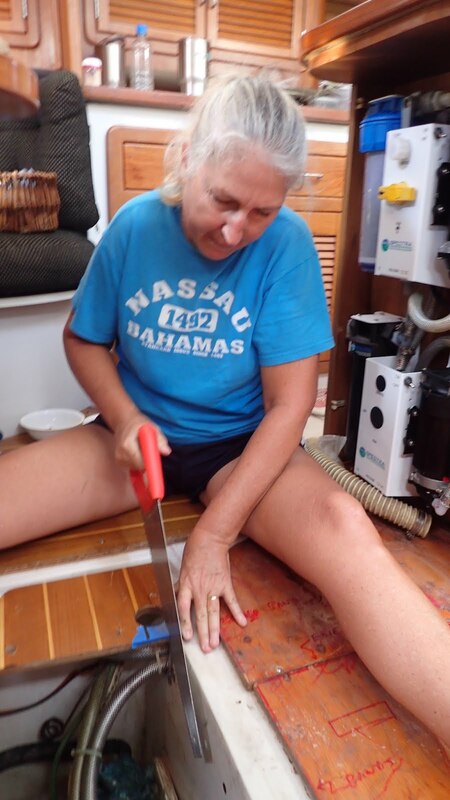 I was able to get four loads done... one of which was our bedspread that got a bit of cat urine dribble... Cruising is such a glamorous life! 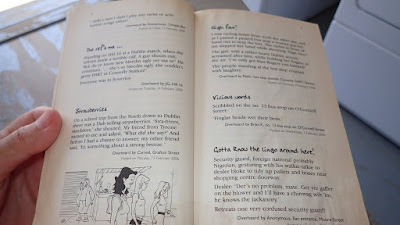 I tried reading but the Irish humour didn't make sense to me. 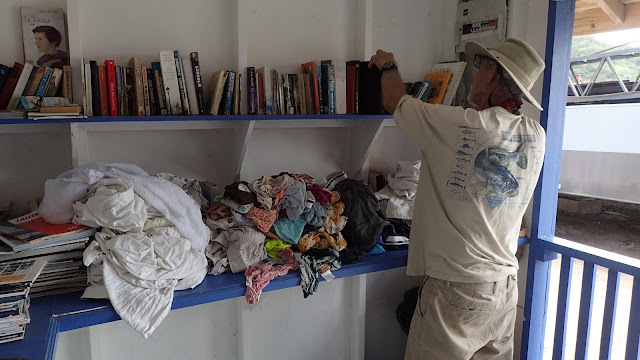 Back at the boat, Bruce watched Jezabelle and waited for the vet...while I did the laundry. It was a long, hot couple of hours and the dryer did a barely adequate job, leaving about half the clothes still in need of line drying. Dr. Carter arrived soon after the laundry was finished. He had the inked finger, so I know he really did vote. Yes. When you cast your vote here in Grenada, they have you dip your finger in ink so that you can't come back and vote again. Simple but effective. Also gets you discounts at many of the local entertainment spots! He climbed up our ladder and did an examination right on our saloon table. Jezabelle didn't seem to know exactly what to think about all of this. Dr. Carter gave her an injection to ease her discomfort and reduce inflammation, then left a 10 day supply of huge antibiotic pills. Instructions: crush half in food twice a day. Unfortunately Jezabelle is such a picky eater, I don't hold much hope that I can get her to eat any of this... but we will see. Tomorrow is another day. Oh yeah... did I mention that there will be NO WORK done tomorrow if the ruling party wins the election tonight? Well guess what! They won! Thanks for the interesting read, Tammy. 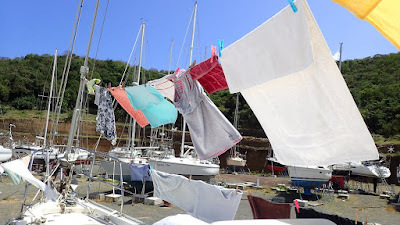 Your boat chore list makes my house chore list seem pretty mundane and deprives me of my lame excuses not to get them done! Oh thank you for your interest! To think that way back when we were in the planning stages, I though that my chores would be fewer living on the boat! Haha! Joke is on me! It's very easy to come up with excuses to keep from doing unpleasant things. And there are still plenty of things on the list that it is just too danged hot to tackle! Wondering what caused the need for reglassing on the sides of your hull. Sorry if I missed that post! We totally brought this all on ourselves. The stress cracks on the sides of our hull were present when we bought the boat. I don't know if there was some event that made them appear or if it was a cumulative thing. I've compared the photos from back then to now, and they don't seem to have increased, so there's comfort in that. Why did we do it now? Well we are thinking ahead to when we are ready to sell the boat, and we were able to get a decent quote for the work here, so we just decided to put the money into the boat now and enjoy it for a while before we sell. Bottom line is that I'm a little bit OCD and the cracks have always bothered me. I'm looking forward to not having to look at them anymore! Same with why we decided to strip ALL of the bottom paint off and start fresh. 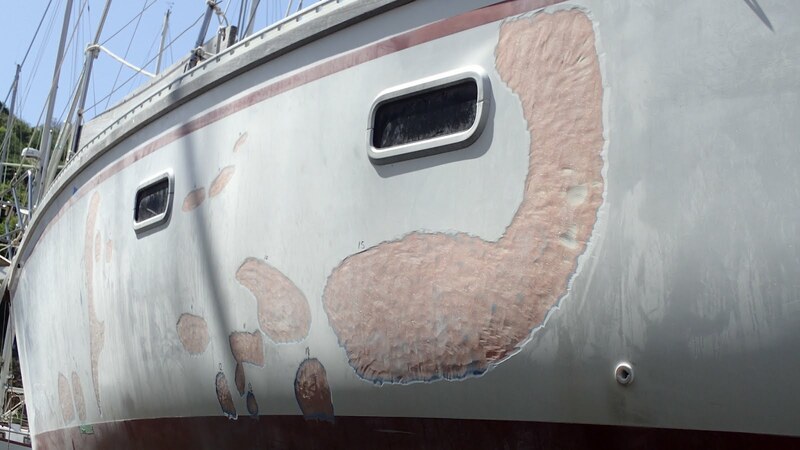 It bothered me that when we brought the boat out of the water the last three times, there were patches where the bottom paint came off in layers. 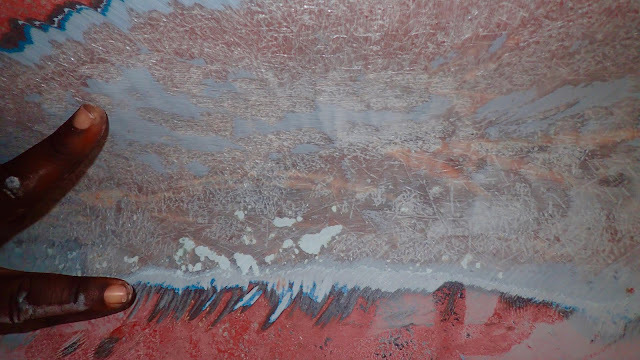 Previously, those have just been fared and painted over. They've always bothered my crazy. Thanks for reading and for your post!